It's easy to get started. just choose a contest, pick your 8 players, and then kick back in your favorite recliner as you watch your team score. Think of it like fantasy football - with an accent. Build a legendary lineup by filling all 8 of the positions below. Just make sure you stay under the $60,000 salary cap. 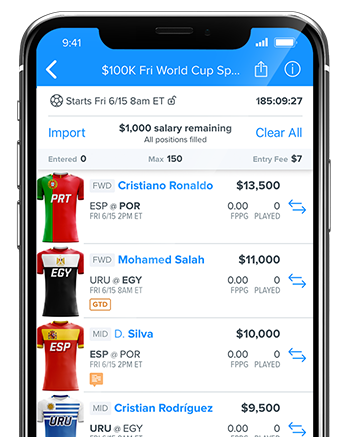 FanDuel Soccer was designed to prioritize the same skills and plays that give real soccer players their value. Since the point of the match is ultimately to score, goals scored are weighted the most heavily. But FanDuel Soccer also gives credit to the less-flashy actions that help lead to wins. As you start to develop your strategies, pay attention to players who are the most involved in the game’s action. They'll usually rack up points in categories like passes, interceptions, tackles, and shots on goal. Here's how you'll score points and get wins. Points accrued by players during extra time will be awarded under the same conditions and at the same values as they are during regular match time. Goalkeepers and defense will be awarded a clean sheet if they play the entire match and do not allow a goal. A goal allowed in extra time will nullify a clean sheet. Goalkeepers and defenses who are facing powerhouse teams tend to get more opportunities for saves (for GK) and interceptions and clearances (for DEF). Look for bargains on value defenses, and save your salary for attackers. Midfielders are the most dependable source for high-upside performances. So pick players who fill the stat sheet, even if they aren’t goal scorers — then look for them to have a huge match if they do put one in the net. Forwards are the most boom-or-bust performers, since most of their points will come from goals. If you’re entering multiple lineups, consider using different combinations of forwards to expand your likelihood of picking up a hot scorer. 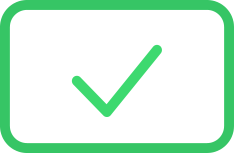 Starting indicators quickly tell you if a player is expected to start and if the player is confirmed to start . So no more second guessing if a player is going to ride the bench or kick it all over the field. Friends Mode lets you play a private league with only your friends. It’s all the fun and flexibility of daily fantasy, with all the trash talk of a season-long league.